Lunch in New York is typically between 11:00 and 15:00. Although 11:00 might seem early, what New Yorkers do is actually skip breakfast and call it brunch. Many places have special lunch menus, with dishes for half the normal price. It’s a pretty good idea to visit the restaurants of your choice during the day – although the ambience during lunch might be a bit different. Asian restaurants in particular often serve their lunches so incredibly cheap, you can’t help but wonder how they do it. Restaurants serving Asian or South American food, are often better priced than so-called European places. As a pizza lover, I recommend first and foremost to get a nice slice at one of my top 5 pizza places. The second pizza place on the list truly is a ‘must’, because they sell individual pizza slices. Another one of my lunchtime favourites: having a burger. You find the best burgers in New York here. Would you like to treat yourself to a good old-school New York brunch? And are you willing to pay for it? 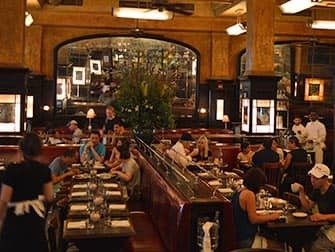 Go to the upscale Balthazar, a pretty fancy restaurant. To give you an idea: eggs with toast and coffee will cost you $30, a grilled cheese sandwich $18. You do get excellent service and great food for these prices, all French food and special dishes. Since Balthazar is right in the heart of SoHo, this is the place to spot models and wealthy people. Fresh, healthy food, without the complicated menu’s or extortionate prices? It’s all possible at Essen. This chain serve their food with a similar concept to Whole Foods: in self-service bowls and boxes. Put your own meal together and take it outside to enjoy on a bench or as a picnic in a park. 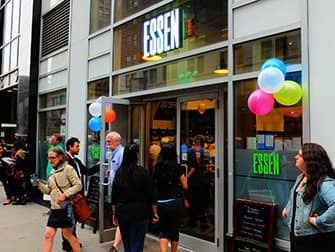 Essen serves foods from all corners of the world, Italian, Japanese, Korean, Chinese and Greek, to name a few. Corner Bistro located in Meatpacking District is one of the best burger places in town with a pub-like setting. They truly only serve burgers here (aside from chili and two sandwiches). On 9th Avenue, between 45th and 50th Street, you’ll find a lot of Thai restaurants. A three or four course lunch will often cost you less than seven dollars. 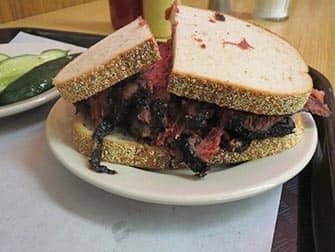 At Yum Yum Too (a place with several branches in Hell’s Kitchen) you can get a nice lunch. Enter the Time Warner building at Columbus Circle and take the escalator down. 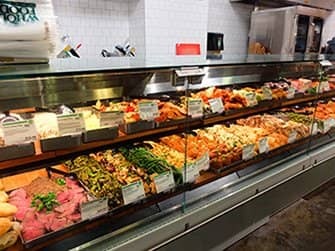 Here you’ll find Whole Foods: a giant supermarket with delicious fresh sandwiches, fresh sushi, pizza (hello again), drinks and so on. They’re also known for their famous soups. The freshly prepared dishes will be served with a special cover to keep them warm. It will still be hot when you get to Central Park – although you can just eat it straight away as well of course! 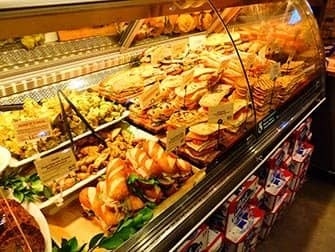 There are many sandwich shops in Manhattan: delis (or ‘bodega’s as New Yorkers call them). 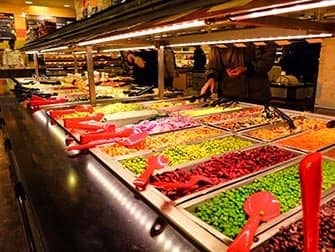 Many delis have a salad bar. Here you can create your very own salad. 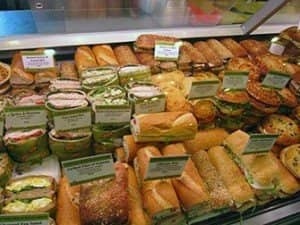 Having a hard time choosing the best sandwich? Always ask for the specialty of the house.